As the architectural and building design space evolves, one of the ways in which the surveying industry can offer a direct benefit to the building design and renovation process, is through the application of technological advances in the area of laser scanning. As a company, we have been involved in the measurement of built spaces since our foundation and have provided clients with services such as net-lettable areas for shopping centres, offices and industrial complexes, as well as feature survey and building plans in the built-form space. With the company’s ability to capture laser scan and photo imagery of existing building developments, we can produce highly accurate models of the current built form, allowing for the design of renovations, demolition and refurbishment. These models also then become the basis for ongoing asset management. Harley Dykstra can also produce BIM (Building Information Modelling) that allows for the establishment of a digital management system. Revit is a leading 3D modelling building design and management package produced by Autodesk. 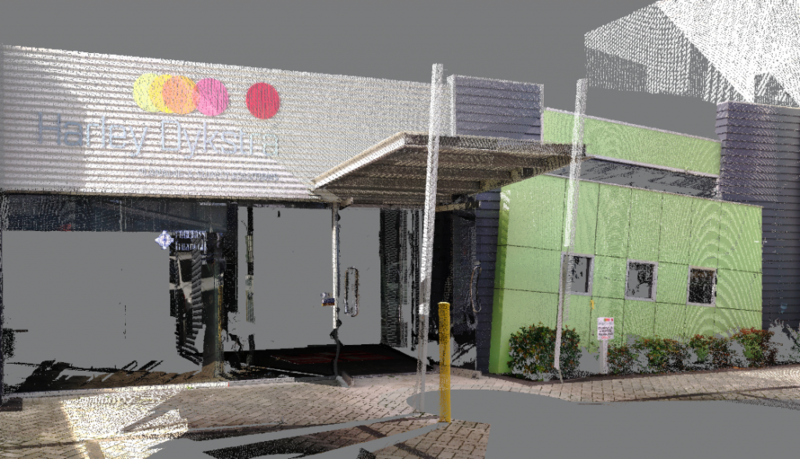 It presently is an industry standard in representing simplified three dimensional building models, however it requires significant work in the extraction of features from the raw 3D information produced by the laser scanner. We have staff with experience in conducting this complicated extraction and are able to use this experience to produce detailed models. Millimetre accuracy and “designer ready” dimensions. Laser scanning has significant benefits in providing data for seamless design for extension to existing buildings and features. It is able to obtain detailed surface measurements, bolt and cleat patterns, verticality and grid-matching capabilities to enable accurate design of extensions to existing buildings or demolition and remodelling of portions of existing structures. These techniques have not been possible in the past using simple measurement techniques therefore these tasks have previously been conducted “in situ” often leading to cost overruns due to the inability to accurately estimate the amount of work and materials required. The application of laser scanning and 3D digital modelling to these tasks takes all of the guess work out of the design and build process and allows for pre-fabricated structures to be made in the controlled environment of a structural workshop. The pre-fabricated structure can then be taken to site with the confidence that it will fit seamlessly to the existing building. In these ways laser scanning provides the direct application of technological advances to solve current building problems.